Contains reports of various Dept. committees and officials plus lists of officers and deceased members. Pub. by the Romanic language teachers association of California. 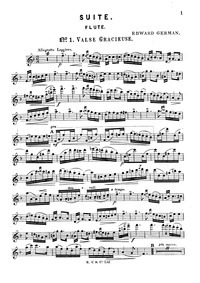 Description: Nell Gwyn (German, Edward); Edward German was a English composer during the Early 20th century period; Piecestyle: Romantic; Instrumentation: orchestra; The score was first preformed in 1900-08-02 in London, Prince of Wales Theatre; Incidental music|Stage Works|For orchestra|Scores featuring the orchestra. 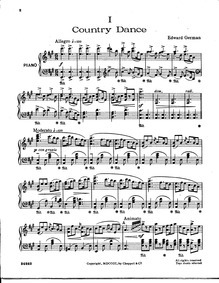 Supplemental catalog subcollection information: American Libraries Collection; Historical Literature; Contains reports of various Dept. committees and officials plus lists of officers and deceased members. 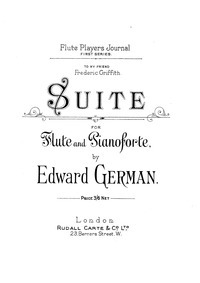 Description: Suite (German, Edward); Edward German was a English composer during the Early 20th century period; Piecestyle: Romantic; Instrumentation: Flute, Piano; The score was dedicated to my Friend Frederic Griffith; Single instrument with piano piece; Suites|For flute, piano|Scores featuring the flute|Scores featuring the piano|For 2 players.